Itani & Company is proud to have been involved in the Women’s Heritage Walk for the second year in a row. 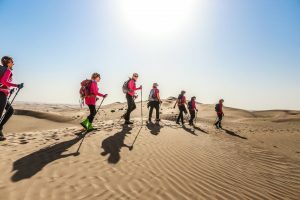 The annual desert trek celebrates the culture and heritage of the UAE and the women who helped shape this great nation and is a recreation of an Emirati migratory trip between the two cities that took place multiple times a year, decades ago. The fourth edition was completed by 43 women of over 18 nationalities who finished the 125 KMs trek on March 13, 2018. The journey began on International Women’s Day 2018 with a private tour of the Al Ain Oasis by the Department of Culture and Tourism – Abu Dhabi (DCT Abu Dhabi), which gave participants an insight into the city and its history. They began their trek in the early morning hours of Friday, March 9th, from Al Bada Hotel & Resort in Al Ain. The group began walking before sunrise every day to complete an average of 25 kilometres daily in an effort to reach their final goal of 125 kilometres on Tuesday. 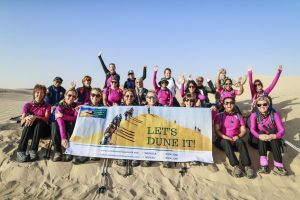 They trained for two months prior to the trip with two weekly desert hikes led by outdoor adventure group UAE Trekkers. 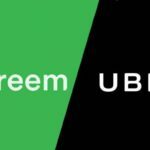 Throughout the trip, the participants were supported by a fleet of Toyota Land Cruisers and desert-trained drivers from Al Futtaim Motors, so that they could take a break if needed. Abu Dhabi Police also escorted the women with a sand equipped ambulance and paramedic team for all five days in the desert to ensure the safety of all involved. In the evenings, they enjoyed cultural activities that highlighted the UAE’s heritage and the this year’s theme of the Year of Zayed. “Honouring the past was one of Sheikh Zayed bin Sultan Al Nahyan’s values. In the Year of Zayed, the Women’s Heritage Walk worked to bring attention to those values in an effort to preserve and celebrate our identity, traditions, and history,” said Asma Al Mutawa, Women’s Heritage Walk partner. For 42-year-old South African participant Celeste Strydom Evans, the chance to experience the UAE’s history and culture in such a unique way made the walk an unforgettable experience. “I am so honoured to have walked such a historical journey. Although time erased the ancestors’ footprints in the sand, we are following the footprints engraved in the hearts of this incredible nation,” she said. The walk was established in 2015 and over 150 women have completed the journey so far. 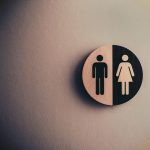 “The Women’s Heritage Walk has grown tremendously over the last four years, and I am proud of this tribe of ‘sand sisters’ and all they have accomplished. None of this would be possible, however, without the support of organisations and companies from within the community that believe in our journey and share our values of highlighting culture and heritage, encouraging women, improving health and wellness, and community building,” said Jody Ballard, founder of the walk. Supporting organisations include The Salama Bint Hamdan Al Nahyan Foundation, The Department of Culture & Tourism – Abu Dhabi, The Fatima Bint Mubarak Ladies Sports Academy, Middle East General Enterprises, Sheikh Mohammed bin Khaled Al Nahyan Center, Adventure HQ, Al Futtaim Motors, Bedashing Beauty Lounge, FitFuse by COÉGA, Sweat Studio, Radisson Blu Media City, UAE Trekkers, Springbok Butchery, Royal Catering, Nolu’s Café, Hunter Foods, and Al Bada Hotel & Resort. 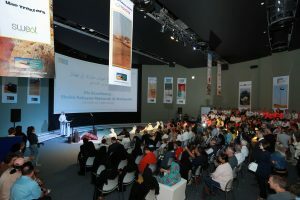 The event ended with an elegant closing ceremony at Manarat Al Saadiyat which was attended by nearly 200 members of the community. 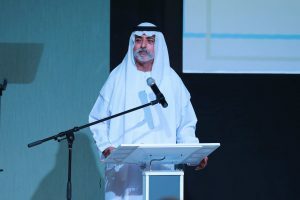 His Excellency Sheikh Nahayan Mabarak Al Nahayan, Minister of Tolerance, delivered the keynote speech and Itani & Company’s Managing Director Maya Itani served as the Master of Ceremony.